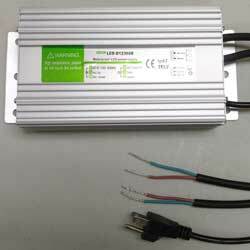 Our Waterproof RGB 12V DC Power Supply can be used to power 12V controllers and RGB lighting. It is IP67 rated for outdoor use, so no enclosure is required. 2 Waterproof Power Supplies are included in our assembled WowLights Intelligent E.31 RGB Controller.